There's an entirely great film living solely within the footage that makes up the complete Force Majeure, and plenty of people would apparently argue that the great film is the final cut. Hence the film's victory in the Un Certain Regard program at the 2014 Cannes Film Festival, its selection as Sweden's official submission to the Foreign Language Film category at the Oscars, and a general wave of goodwill that has never slowed down in the months since the film's premiere. And I suppose I'm glad: it's never the case that I particularly want people to be unhappy in watching movies, and if there are folks for whom this has risen to the top of the heap as one of 2014's most important and accomplished and emotionally resonant film, that pleases me. Myself, I walked out of the film, having gone into expecting the best thing I'd see at the Chicago Film Festival this year, and my response was a resolute "Okay, so that was fine. I don't regret having seen that movie". Simply put, Force Majeure suffers from a script by Ruben Östlund, who also directs, that assumes that we're... well, not dumb. But a little addle-minded, and not entirely paying attention, so over the course of a two-hour movie, we need to get the exact same information presented in almost exactly the same way, multiple times. And then reiterated once we're past the point that it would seemed even slightly possible that we might need to have it confirmed that yes, patriarchal hierarchies are untrustworthy and broken, and yes, romantic relationships start to break apart when they start to be based more on lies than respect, and yes, human beings are torn between an animalistic desire to survive at all costs versus a humanistic drive to protect and be kind even at the price of our own safety. 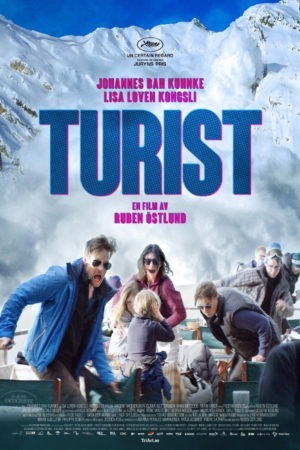 Basically, the film sinks so much time and energy and a pair of really tight, focused performances by Johannes Kuhnke and Lisa Loven Kongsli into confirming some deeply musty old gender-based clichés about how women are better with children than men are, and then tries to retrofit it into a kind of thriller about married life. And while parts of it are very good - parts of it are, in fact, impeccable and flawless and heart-stopping filmmaking genius - the whole thing is not as good as the sum of its parts. The plot: a Swedish family is vacationing in the French Alps on a skiing trip: on the second of five days, a controlled avalanche gets too close to the outside patio where they're having lunch (and this film-defining incident doesn't play for me, honestly: what the hell drives any halfway sane person to eat outside in below-freezing weather? But then, I am not a skier, either), and briefly douses them in frozen mist through which it's only possible to see a few inches. When the air clears, Ebba (Kongsli) realises that while she immediately dove to protect her children, Vera (Clara Wettergren) and Harry (Vincent Wettergren), her husband Tomas (Kuhnke) could barely stop long enough to grab his iPhone before running the hell away. This betrayal, which he denies ever happened, colors the rest of the trip and makes for some rather uncomfortable interplay in the family's small hotel room; things get even worse when Tomas's friend Mats (Kristofer Hivju) and his 20-year-old girlfriend Fanny (Fanni Metelius) show up, and Mats's bumbling attempts to smooth things over between the couple makes things even more awkward and defensive. No synopsis can ever reveal Force Majeure's greatest strength, which is how frequently hilarious it is. From the opening scene, in which the family tries to position themselves as a perfect little collection of winter gear models in front of an unseen, exuberant photographer, Östlund frequently finds the most dizzingly funny possible angle on the rather severe material; it shouldn't be possible for a scene in which a married couple has a tear-filled fight in a hotel hallway, observed by a bored janitor, to be laugh-out-loud funny, but the bone-dry editing scheme and the detached compositions inside the hyper-sleek skiing lodge are ironic enough to make even the most sober and devastating moment feel sneakily sarcastic, laced with a black wit that turns the characters' distress against them a little bit. It stakes out a level of superiority over the couple - the craven Tomas, obviously, but even over Ebba, whose desire to just return to bourgeois comfort is something the film hardly respects her for - that makes the whole thing more of a caustic analysis of their relationship than a close and intimate exploration of how it feels, and this at least makes it rather different and more biting than most European marital dramas. Meanwhile, it's spiked with a few moments of true magnificence: extreme wide shots of the ski resort at night as a remote neverland, something inscrutable and dangerously fragile; or a climactic sequence in a thick snowstorm, where shapes and muffled sound create a beautiful feeling of sustained caution and fear. And absolutely everything that happens between Hivju and Metelius is brilliant, sparkling awkward comedy that makes one long to know why these weren't our protagonists. So with all that in its favor, why am I cool towards the film? The repetitiveness is a big thing: the same conflict keeps playing out with little or no variation, either in the stakes or in the way the actors approach it, and it frankly gets boring. The flopping last act is another: after one apparent ending that would have been horrifyingly unresolved but artistically sound, and one that would have been coolly ambivalent and just about perfect, the film plugs right on through to a weird, protracted sequence involving a bus, and it's the most aimless damn thing, making a hash of all the characters arcs to that point and attempting to randomly score one last "by the way, this guy is a bad father" point that's not connected to anything else. Even in its very best, the film isn't "special" - the "Euro-art about a tense marriage falling apart on vacation" genre is pretty well-established at this point, and Force Majeure has nothing on The Loneliest Planet, just to name the most obvious comparison - and its structural missteps don't help at all in compensating for that, no matter how terrific most of the acting is, or how beautiful individual shots of the mountains can be. It is, again, resolutely fine, but try as I might, I can't convince myself it's any better.